This bicycle tour will take you around the fjords to Oslo, Norways' coastal capital. Discover the hidden charm of the harbour villages along the fjords, while cycling on cycle paths and minor low-traffic roads. A detailed route description and map will help you to find your way through the few rolling hills along the gentle fjord landscape. Wondering about bringing your swimwear to Norway? The water isn't as cold as you might expect. You will pass many beaches along the way and should take the opportunity to brag about swimming in Scandinavia once you are home! Drammen is located 50 km west of Oslo. It is easy to reach by train (40 mins to 1 hour) from Oslo Airport. You can take the Airport Express train or a local train, they are both direct. The day will start with a slightly uphill route, through agricultural fields heading for Sande. After Sande, you will catch up with the fjord again, arriving in Holmestrand in time for lunch. Spend the afternoon cycling along the country roads to Horten. This town used to be a navy base and you may visit its fortified naval museum, called Karljohansvern. Your hotel is close to the harbour. You will leave Horten on a bicycle lane, which takes you along the coast to the small town of Asgardstrand. The painter Edvard Munch spent many summers here and you may visit his small wooden house, now turned into a museum. Continue on to Tønsberg, known as the oldest town in Norway. The town is of great archaeological renown known due to its Norse ship burial sites constituing some of the finest Norse craftsmanship ever excavated, and you have the chance to visit a shipyard making copies of these ships with old tools. In the afternoon, your itinerary continues through a farmland landscape to the town of Sandefjord. You will start with an early morning departure on a car ferry from Sandefjord to Strömstad in Sweden, on the east side of the Oslo Fjord. The crossing takes 2.5 hours. 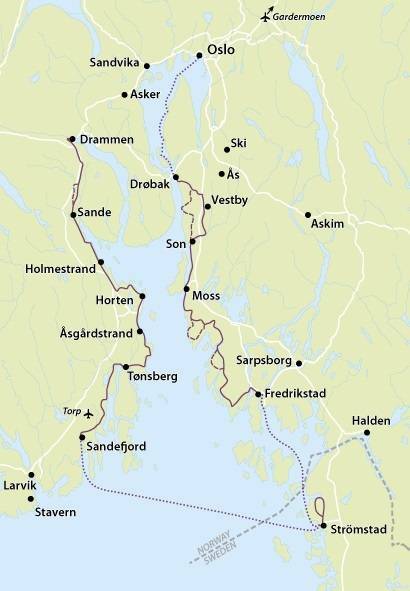 Arriving in Strömstad, you will be cycling on a 15 km loop on minor roads north of the town. You will pass some great beaches, so bring your swimming gear! The small town of Strömstad is famous as a harbour for shrimp fishing, and has a nice downtown area with many restaurants and shops. In the afternoon you will board the passenger ferry Sagasund, which will take you along many islands back to Norway and to the town of Fredrikstad in 2 hours. This town has the nicest fortified old town in Norway, situated along the river Glomma. The bike route today will lead you north, along the coast past the island of Hankø. After a few hours, you can choose a 5 km longer, but more scenic, route along the fjord or a shorter route inland. In the afternoon you will reach the town of Moss, with typical wooden Norwegian houses. The old wood and paper industry has been replaced by cafes and art galleries. Our hotel for the night is either in Moss (Cat. B) or in Son (Cat. A), a nice little harbour village 10 km further. Leaving Son you will have a choice between two different routes on country roads through rural areas. On the first choice, you pass the village of Hølen, and continue along a bicycle lane to Vestby, a rural commercial center. The other choice is hillier and brings you to the village of Hvitsten. Our tour ends in Drøbak, a lovely little seaside town where the fjord is at its most narrow. Here you may visit the aquarium or go to check out Norway's biggest center for Christmas celebrations. You will leave your bike here in Drøbak, and then take a regular boat or bus back to Oslo. Breakfast at your centrally located hotel in Oslo giving you a great opportunity to explore the capital city before departure. Flat with some rolling hills, this route is suitable for any cyclist of reasonable ability. We recommend flying to Oslo airport to reach the starting point of this cycling holiday. The Oslo and the Fjords cycling holiday includes the daily transfer of luggage to the next hotel and local support if required. The hotel list below is subject to change and should be used as a guide. We will confirm the exact hotels prior to arrival.